Minnesota Twins baseball is ON THE BLOG! - MLB TV - A geek's new addiction. - John's DVR - Friends? You don't need no stinkin friends! - Advil - Because you're middle-aged, dummy. - Mendota Springs Strawberry Sparkling Water - For when you're out of beer. - The Voice of Reason™ - Widowed spring, summer and fall, since 1994. Hello everybody, and welcome to Minnesota Twins Spring Training action! I'm your blogger, Twins Geek, and we're about to bring you eight full months of baseball action. 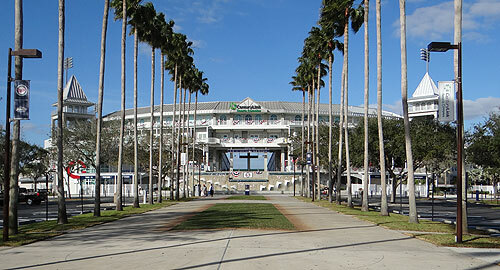 Tonight the Twins will kick off their spring training season against the Boston Red Sox. I'm joined today by my partner, the Geek Chorus. Thanks Geek. Very glad to be Morgan Mundane to your Steve Cannon. Chorus, you gotta like what we see of Michael Cuddyer in this first inning. A rocket throw from right field to third base, a nice running catch, and a drawn walk in his first at-bat. Cuddyer has yapped a lot this spring about how hungry he is, and that actually raised some red flags in my mind, because I wondered if he wasn't protesting too much. But he looks determined and focused today. Plus, we're almost ten minutes into the season and he's not hurt. A good innning. I'd like to say the Twins exploded for four hits and three runs but "explode" should be reserved for hits that clear the infield dirt. The Twins were awarded four hits, but the most legitimate was a blooper. It resembled a Friday night softball league. Except that the softball team usually knows how to slide. Yeah, Alexi Casilla easily stole second but decided to start sliding approximately 10 inches from the base. And that was the second worst slide of the inning. The worst was by Delmon Young at home, which was awkward enough to be painful. Paging Dr. Molitor. Dr. Molitor to the third base line, please. Brian Buscher gets his second hit of the night, both of them pulled and hit hard down the first base line. I wonder, if the Twins carry 12 pitchers, whether he'll make the roster. After all, Ron Gardenhire loves to have two backup middle infielders on his roster, but he also loves having a left-handed bat on the bench. I'm switching my stance from earlier in the offseason and saying Buscher is probably screwed. The problem is that if Gardy carries Buscher, he needs a second middle infielder. But if he carries a second middle infielder, he can often live without Buscher. The guys who are most likely to be hit for in this lineup are Punto, Gomez and Casilla. Assuming Gomez is on the field, then either Span, Cuddyer or Young is on the bench, so he's taken care of. The other two guys are middle infielders, and if you hit Buscher for one of them, then Brendan Harris needs to field for him. Now you've wasted Harris as a potential pinch hitter, and there is nobody to pinch hit for the other middle infielder. And if you pinch hit Harris, you can't use Buscher for the other middle infielder, because there is nobody left to field for him. On the other hand, if Tolbert is on the roster, you can hit Harris for a middle infielder and still have Tolbert on the bench. Gardy can then pinch hit one of his outfielders and then bring in Tolbert. Got it? Um, what's on second? I don't know. Third base! Anyway, that's why I think Gardenhire is talking about only eleven pitchers. It would allow him a big enough bench to pinch hit three timee every game. Plus, it would allow the team to send yet another message to Jose Mijares about respecting the game. You mean beyond waiting until the middle of September to get him into a major league game when they desperately needed an eighth inning set up guy? Wasn't sacrificing a postseason message enough? Apparently not. Have you seen him this spring? He reportedly looks like he ate Boof. Joe Nathan gives up the first Red Sox run of the game, on a couple of hits and a passed ball that looked like he crossed up Mike Redmond. Here is the Twins nightmare scenario this year: Nathan gets hurt. He's been answering the bell reliably for six solid years now, and that's feeling like borrrowed time. I have every confidence that Gardenhire and Rick Anderson can piece together a decent 'pen with some of their minor league talent by the middle of the season, because they have that much depth. But I don't see anyone replacing our Shaggy look-a-like. We see our first outing of Luis Ayala. He give up one baserunner, but on an error (I hope they ruled it an error) by Justin Morneau. I'm guessing he makes a good first impression on the Twins staff, becuase I count something like seven strikes and just two balls. Oh, and four batters, too. Those are the kind of statistics they're gonna love. As opposed to fascist strikeouts. Right. And I think that's going to have to do it for tonight, as the Twins have started subbing in players that only Seth and Roger recongnize. On behalf of my partner Geek Chorus, thanks for joining us tonight. The final score - the Twins 5 and the Red Sox 2. So long everybody! That's about right... I started watching in about the 7th inning, to see those guys... and hey, Danny Valencia went 2-2! Great job. Keep the reports coming. We'll be joining you in 10 days! Buscher played second base for at least one game last year. I don't think they'd put him at Short, though, so he can't really be called a utility infielder. That's disingenuous. Mijares didn't start pitching until July last year because of an elbow injury suffered in a car accident during the spring, was rushed through three levels of the minors once he returned (never threw more than 15 innings at any level last year) and was called up directly from Double-A in the beginning of September. If anything, the organization's handling of Mijares last season was uncharacteristically aggressive. Nick, I started replying, but it just begs for a blog post. I'll reply on Monday. I hate to give Reusse credit for anything but when asked about Mijares being a lock for the bullpen in the fall he responded with "Rich Garces".